I recently discovered a fantastic app that does one thing, and that one thing very well. It conjugates Korean verbs. Dongsa, the free app that makes the features of dongsa.net more accessible to smartphone users, is exactly what you need to download (also available for Android, not just Apple) or visit right now. Maybe conjugation isn’t a big deal to you, but conjugating can get confusing very quickly, especially when you’re just starting out as a Korean-language learner. It feels like there are way too many different politeness levels – all with their own variation on conjugation. Dongsa provides for this. Wondering how to conjugate the verb for “to hit”? Go ahead and open Dongsa. 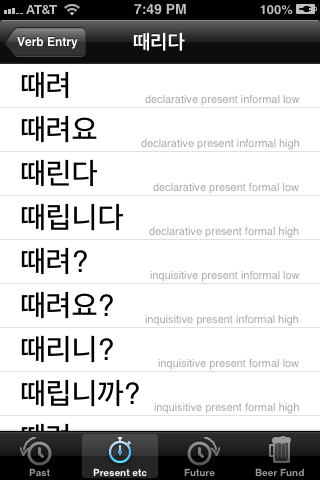 Notice that the app includes helpful notes for each conjugation – declarative? Inquisitive? Formal level is low? Dongsa will let you know. 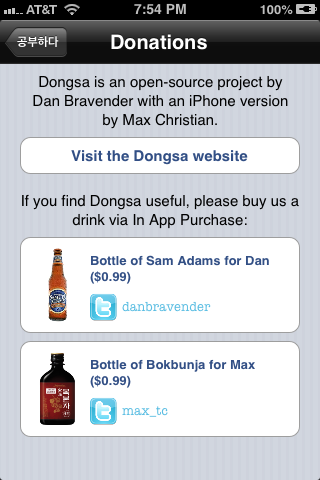 There isn’t much to say about Dongsa other than that it’s super useful, free (you can donate to the developers’ beer fund if you feel really happy about how helpful Dongsa is), and simple to use. It comes in different tenses, how sublime! I was just wishing for something like this today. Awesome! Thanks!